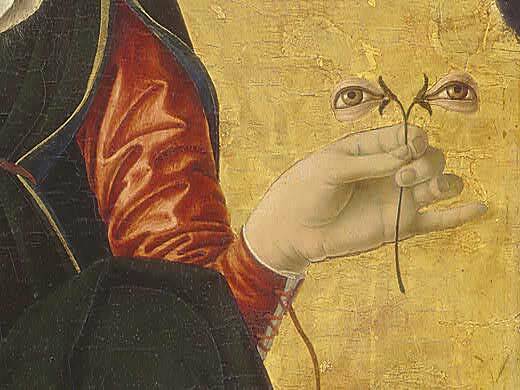 Francesco del Cossa, Santa Lucia (detail), c. 1473-1474. Tempera on panel, National Gallery of Art, Washington, D.C. I love to read but don’t really get the opportunity to get into books unless I am on vacation or travelling. I find its impossible for me to find the time or the required head-space to focus on good literature when the dogs have to be walked, the office needs tending to, the groceries have to bought, the walk has to be shovelled … Really getting into a good book means setting aside all the things I have to do in order to find the time for something I want to do. 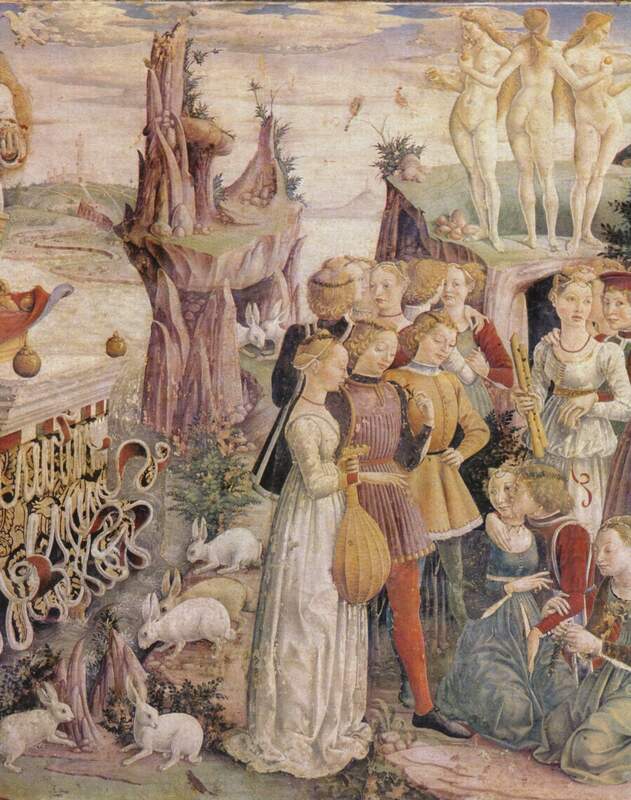 Francesco del Cossa, Allegory of April: Triumph of Venus (detail), 1470. Fresco, Palazzo Schifanoia, Ferrara, Italy. My night table is usually piled with books I’d like to find the time to read: books that were short-listed for one literary prize or another; historical examinations of something arcane that I feel I really should get a handle on (although I know it’s unlikely I ever will); books by authors I admire and think I should get to know better. The pile is like those shape-shifting sand dunes in the Sahara – it is always there but occasionally it looks a little different. I like to write and I like to read. As a writer I find that I am a hyper-critical reader. Because I know how difficult it is to get a book published, I expect that the books that I read feel (at least to me) worth reading. When I read a second novel by an accomplished first-time novelist and find it lacking in the same verve and finesse as the author’s first work, I not only feel disappointed, I feel cheated. (I am part of that dying breed that actually buys hardcover books: when I invest in reading, I really invest.) Alternatively, when I happen to stumble across a book that captivates me and makes me stay up late, I experience a sense of admiration tinged with jealousy: will I ever be able to write that well? Will anyone ever read a book of mine and not want it to end because the words on the page flow so well and easily? 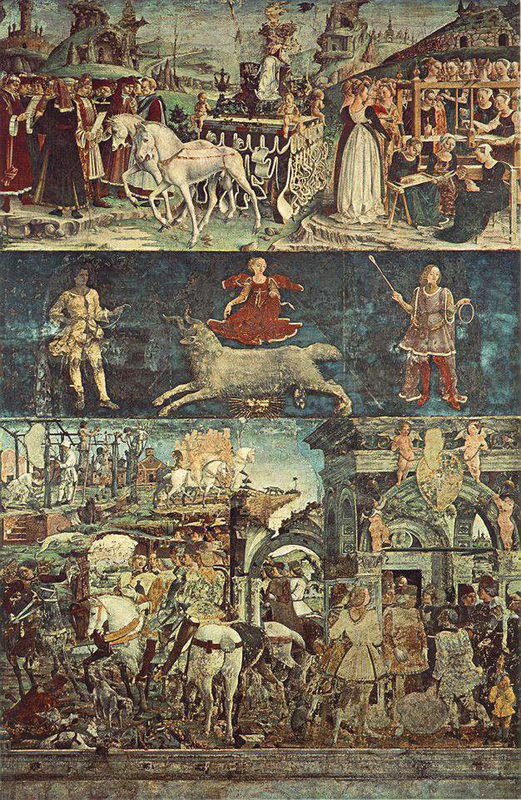 “At the heart of Smith’s novel is an allegorical fresco of the seasons by the 15th century artist Francesco del Cossa (he’s real, and so is the fresco). In the book’s contemporary section, 16-year-old George (short for Georgia, but named for the song “Georgie Girl”) recalls a trip with her mother to see the attention-grabbing mural in Ferrara, Italy — just four months before her mother, an economic journalist famous for leading a subversive artsy Twitter movement called Subverts, dies unexpectedly at 50. Francesco del Cossa, Allegory of March: Triumph of Minerva, 1476-1484. Fresco, Palazzo Schifanoia, Ferrara, Italy. Francesco del Cossa, Detail from the Allegorical Frescoes in the Palazzo Schifanoia, Ferrara, Italy. George becomes obsessed with del Cossa’s only painting at the National Gallery in London — where the reanimated artist, wandering in this oddly horseless purgatorium of people affixed to their “holy votive tablets,” finds her in the other half of the novel. This, George has noted, is “exactly the kind of stunt her mother would pull.” While you’re “waiting and waiting” for “the person you needed” to come back, what you’d get would be “some dead renaissance painter going on and on about himself and his work and it’d be someone you knew nothing about and that’d be meant to teach you empathy, would it? While I usually write about posters, or myself, or myself and posters, I felt that this book provided me with a whole new way to see and read art. With posters, as with Renaissance frescoes, there really is much more to see, if you look. You just have to train your eye, be patient, and open your mind. Read the book and you’ll see what I mean.